Bunch Of Carrots Bubble Bars | £5.95 // This is one of the reusable bubble bars that you swish about in the water to create the bubbles and then leave it to dry for the next bath. These came out last year as well and they lasted a really long time especially as you get three of them. The scent is a lovely mix of lemon and bergamot. Hoppity Poppity Bath Bomb | £2.50 // This is another bath bomb that fizzes away quickly but has popping candy inside to make it a bit more interesting. It starts off white but as it dissolves it turns pink and you can really hear the popping candy. This is a lot smaller than the usual bath bombs so it's good that the price reflects this. I prefer the smaller size as I often feel like I'm wasting the larger bath bombs when I use it all in one bath. I really like the scent of this one and it's a bit different to the usual Lush scents as it combines lime, violet and lavender. 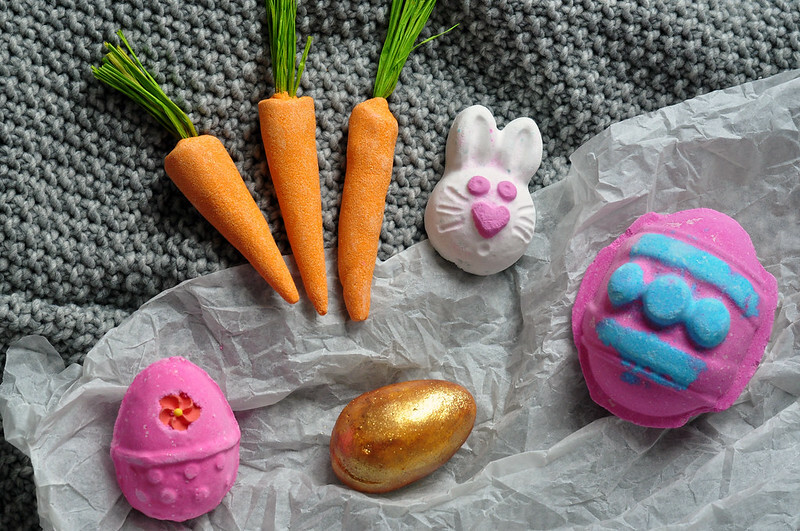 Fluffy Egg Bath Bomb | £2.95 // If you like the Think Pink bath bomb and Snow Fairy shower gel then you'll love this one as it has the same scent but in a Easter egg shape. It's quite a sickly sweet candy floss scent which I really like but every now and again. This fizzes away really quickly as soon as you add it to your bath and there isn't anything particularly special about this one compared to others. It turns your bath water pink and smells nice but that's about it. It's moisturising but I wouldn't rush out to buy back ups as you can buy the similar one in the normal range. Golden Egg Bath Bomb Melt | £3.75 // This smells like the now discontinued Ma-Ba Bubble Bar that was one of my favourite Lush products. I'm still hopeful they'll bring it back, at least for a limited time in the Lush Kitchen, but for now I'll have to buy a couple more of these to keep me going. It has a honey and toffee scent a bit like Honey I Washed The Kids Soap as well. 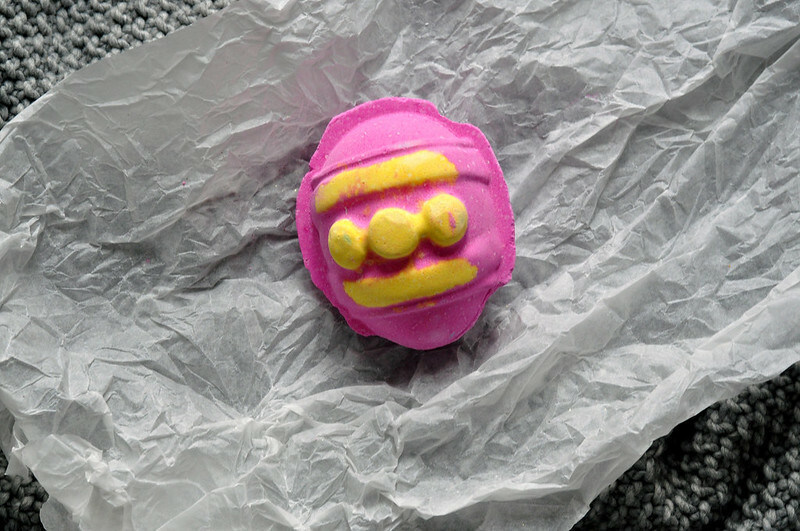 This is a bit of a strange one as it combines a bath bomb and a bath melt. The outside is more like the traditional Lush bath melts so it dissolves slowly releasing cocoa butter and olive oil. The inside is the bath bomb and fizzes away quicker. The glitter is very fine and only on the outside so this is easily rinsed away if you don't want any in your bath but honestly once it's in the water, you don't really notice it and it doesn't stick to your skin. The only negative about this is the colour it turns your water, not the most relaxing or pleasant but something I can ignore purely because of the scent. You could easily cut this in half as well and get two baths out of it. 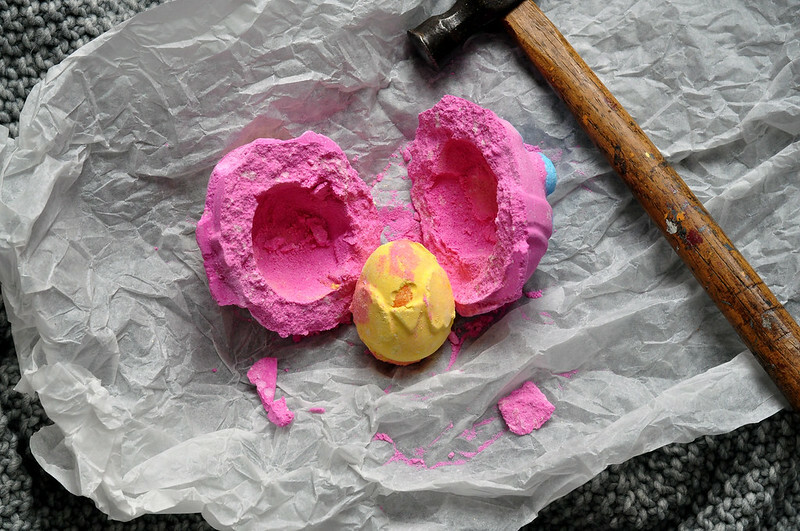 Immaculate Eggception Pink Bath Bomb | £6.95 // Although it does seem expensive for a bath bomb, you can actually get at least three baths out of it when you break it in two as there's a small chick inside. I really love the vanilla, grapefruit and lemon scent although the bath bomb itself is more on the plain side.